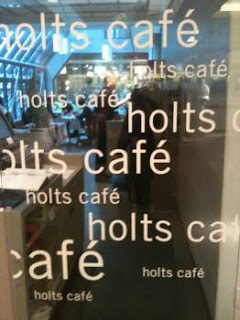 Situated on the second level of Manulife Place in Holt Renfrew, Edmonton's Holts Café is one of four locations across Canada. The interior is cozy & modern with light streaming in through a large window adjacent to the mall atrium (be sure to request a seat next to it in your reservation!) During the week, soup & sandwich specials change daily, and the menu varies seasonally. I wandered in (without a reservation) just before the noon-hour on a Friday and was seated promptly in the near-empty restaurant, but business picked up shortly thereafter. I started off with the rutabaga & oka cheese soup. 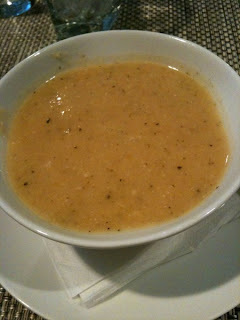 Rutabaga and other root vegetables were pureed to create a perfect, slightly thickened consistency for the soup. A few large pieces of the oka cheese (a semi-soft and fairly pungent Canadian cheese) sat at the bottom and melted slightly. I would have preferred the cheese without the rind, and in smaller chunks that could blend a bit more with the soup. Though I'd heard rumors of the slow service at Holts Cafe, my braised bison short ribs arrived within 15 minutes of ordering. 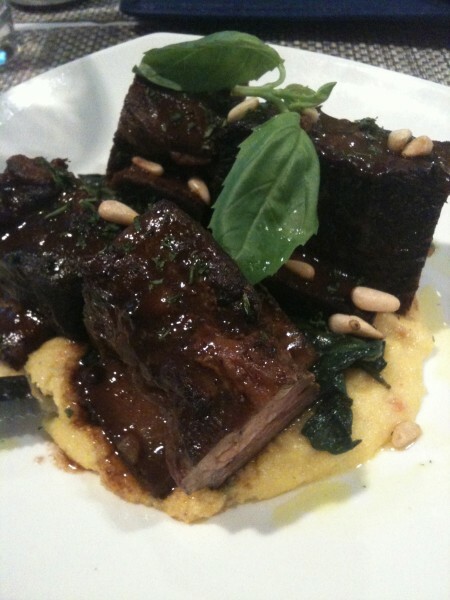 The care and attention to detail was readily apparent in the beautiful presentation of the ribs, atop a mound of polenta and creamed spinach. The portion was generous and the ribs delicious, savory, tender & falling off the bone. While the spinach was a bit salty for my liking, the texture and flavor of the polenta complemented the ribs and toasted pine nut garnish very nicely. Garnished with a pomegranate reduction, whipped cream, and a gooseberry I truly ate with my eyes as I took in the gorgeous presentation of the panna cotta. 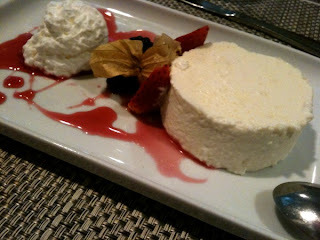 When I dug in, I found the panna cotta delightfully bright with orange zest, balancing the richness of the marascopone. The pomegranate reduction was not overly sweet, and offered nice contrast to the orange flavor. No trouble finishing this one. The prices on the regular menu items can be steep, so to save some dough, keep an eye on the special board and pounce when the feature sounds especially appealing; however, if you're prepared to splurge or your boss is picking up the bill, the menu items I tried arrived promptly, were presented beautifully, and were quite tasty. Among the many options available to those searching for place for lunch downtown, Holts Cafe is classy, yet accessible, and succeeds in their efforts to focus on seasonal & local ingredients without neglecting flavor or presentation. 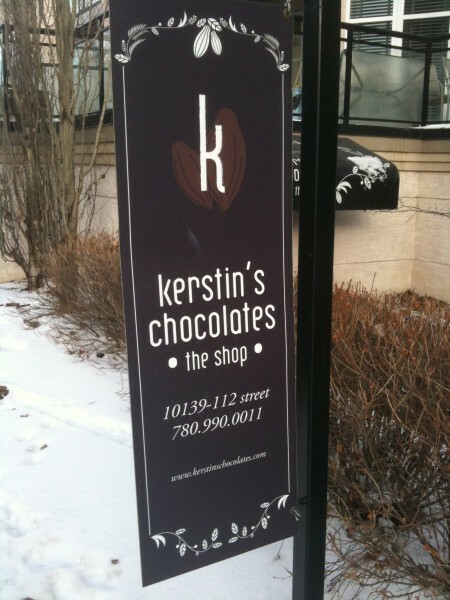 Kerstin's Chocolates has been around in Edmonton since 2003. Her love of food has taken owner Kerstin Roo around the world, and along the way she developed a passion for chocolate making. 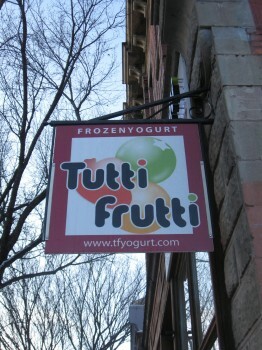 Located on the south side of the Gates on 12th condo complex, the shop has been around since 2008. 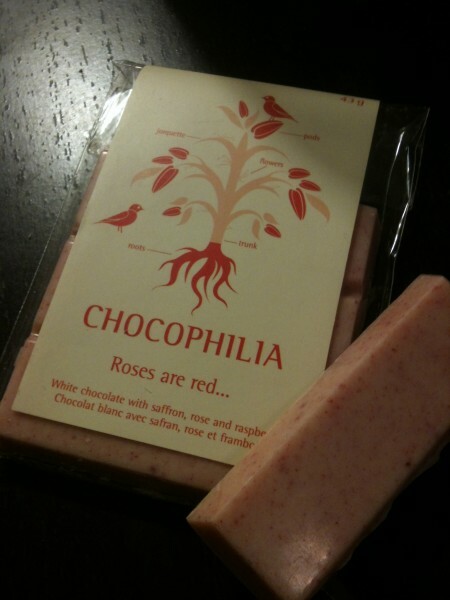 Inside, visitors will find an assortment of chocolate pieces, handmade by Kerstin and her team, as well as Kerstin's Chocophilia series of chocolate bars, chocolate caviar, and drinking chocolate. A variety of imported chocolate is available as well, though I focus on Kerstin's products below. Drinking chocolate mix is available for purchase in store, or you can have a cup prepared for you in-store with hot steamed milk. 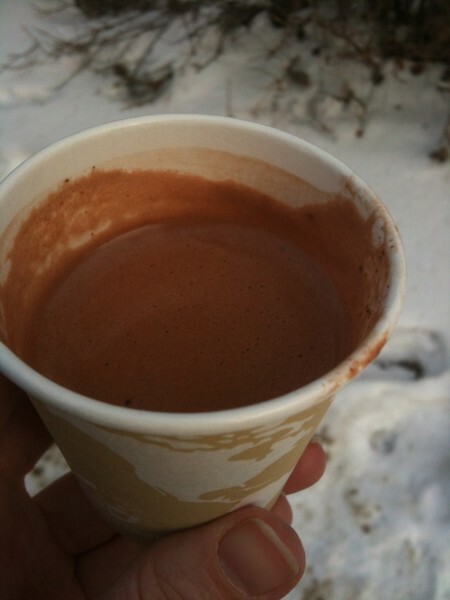 A small Dixie cup will set you back $2.50, which would be steep if it were just hot chocolate, but one taste, and you'll know it's so much better. It's thickness was less than fondue but more than hot chocolate, and its flavor was creamy, and, of course, deeply chocolaty. If you like ginger, give the chocolate dipped ginger slices a try. 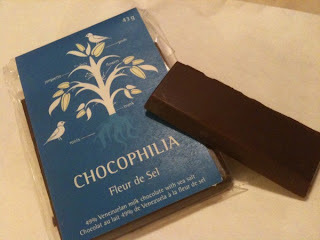 The milk chocolate was smooth and delicious combined with the sharp bite of the candied ginger. 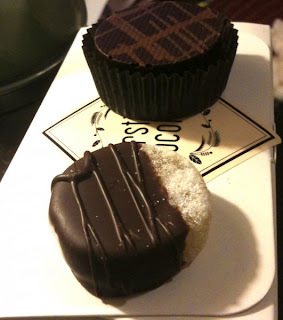 The dark chocolate dulce de leche cups were very easy to enjoy. I loved letting the dark chocolate melt away on my tongue to unveil the thick, creamy, caramely dulce de leche. Kerstin's peanut butter cups are available in milk chocolate and dark chocolate varieties. Since the dulce de leche cups were dark chocolate, I picked milk for these. The milk chocolate was delicious, as expected, but these cups were just bursting with the smooth & creamy organic peanut butter that I couldn't appreciate the chocolate on its own (the dark chocolate may have asserted itself more). That was just fine with me -- I'm a peanut butter junkie! Kerstin's didn't let me down! Among Kerstin's homemade line of the chocolate bars, Chocophilia, fleur de sel is the most popular variety. The milk chocolate was like velvet in my mouth, and the salt was a nice addition that resulted in a flavor similar to chocolate covered pretzels. Roses are red... is one of their Valentine's seasonal offerings which has a backbone of white chocolate with saffron, rose, and raspberry. I definitely enjoyed the white chocolate, but found the rose oil overwhelmed any saffron or raspberry flavor to it. The Pumpkin Pie variety had all the great spicy flavor of pumpkin pie with an appropriately understated chocolate flavor and smooth chocolate texture with little bursts of crunchy graham crumbs. 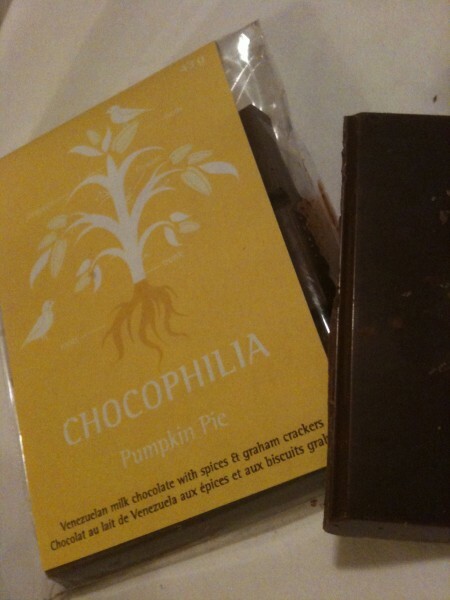 Of the 3 Chocophilia flavors we tried, this was my favorite. Like a good portion of the population, I'm not picky when it comes to chocolate; it's hard to find a variety I actually dislike. But any chocolate fiend should recognize that not all chocolate is equal. 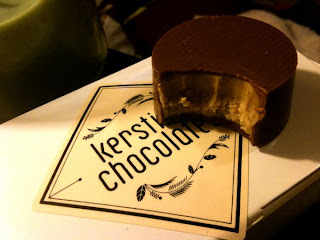 The products at Kerstin's start with excellent chocolate and the results are fresh, high quality, undeniably delicious, and luxurious in the mouth. If you're looking for a tasty gift or just want to treat yourself, have a look (and a taste) at Kerstin's Chocolates. When we arrived at The Next Act on Sunday in the mid-afternoon, we were surprised to find it bustling. They've got a decent beer selection with Alley Kat on tap, and a very impressive menu offering a range of food which something for any palate (from greasy classic pub food to fresh salads and homemade soups). 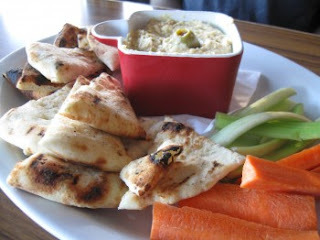 We started off with the hummus appetizer which was served with carrots & celery sticks, as well as some warm naan. The hummus was thick and garlicky with a hint of lemon -- very easy to enjoy. The portion of the hummus was quite generous, and there was still a small amount left when we'd expended our bread and veggies. It was a hearty appetizer for two, but could easily be spread out to serve three to four as well. 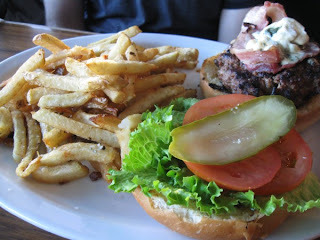 The writer burger comes topped with blue cheese and a tasty pancetta. There is no doubt their patty is homemade; it was hand-formed to a generous thickness, juicy, flavorful, and filled with chunks of onion imparting little bursts of even more flavor. The blue cheese was quite pungent, particularly since it had all been plopped on to the centre of the patty -- next time I'll spread it around for better distribution. The fries were homecut, crispy, salty, and addictive. 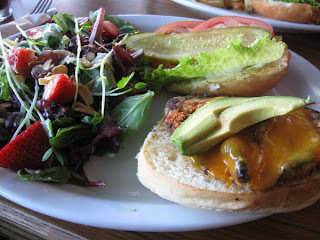 The chicken in my cajun chicken burger was perfectly cooked and very juicy. It was seasoned without much heat, though it could have used a little with the creamy avocado and mayo waiting to counterbalance it. I substituted salad for fries, and while it was beautiful to look at, a only scant amount of their [tasty] dressing was drizzled over top. I hate trying to toss salad myself when it's on a plate as a good portion of it always winds up falling on the table, and this was no exception today. 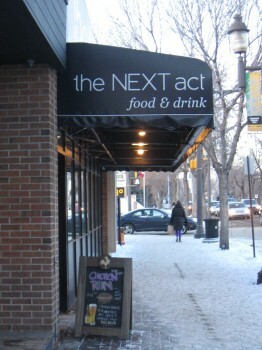 The Next Act's fresh & updated take on pub food yields delicious results. It's comfortable, lively, and the service is friendly and swift. It's a great place to meet some friends and gab over Aprikats, but the food is much too good to pass over. So get together, have a beer, grab a sandwich, and enjoy! It was another dreadfully cold night when we arrived at The Druid for dinner & a few drinks. Thankfully, they've got a good-sized parking lot right out back so the car-to-entrance sprint wasn't too long. In their area of town, free, close & plentiful parking is a definite plus. Upon entering, The Druid is warm and inviting with a big main bar located centrally, lots of darkly stained wood and some folkish faux-stained glass dividers. Contrary to other reviews, I did not find the music too loud, even when open mic night was underway later on (though it did get louder). Visitors should keep in mind that this place is definitely a pub first (and is 18+, accordingly). There was no way we weren't starting with the Irish potato nachos. These "nachos" start off with a foundation of homemade potato chips, and they are heavenly! Oily, salty and crisp all at once, they were the dish. Of course, the onions, mushrooms, tomatoes and cheese they were topped with made things even better. They also came with a side of sour cream and salsa, which I don't think anyone made much use of. They weren't needed, plus the thin potato chips broke off in them more than regular tortilla chips would. The Irish cheddar melt brought us down from our potato chip high. All three of us agreed that the baguette was just too much, overwhelming the sandwich. The cheese, onions, & Guinness BBQ sauce were a bit sparse to begin with. The steak fries, on the other hand, were fine, but were particularly good dipped in the Guinness gravy, which did indeed have a notable taste of Guinness to it. I was a little disappointed when my steak sandwich came out, because it really didn't look light much on the plate. Unlike the Irish cheddar melt which was overwhelmed with bread, my ciabatta to steak ratio was pretty low. I ordered a side of hunter sauce for an extra $3 with my meal, and it was definitely worth it. It's made to order with the steak drippings, onions, some Guinness, and thickened up. After initially tasting it, I poured it over my steak sandwich and devoured the dish. The Caesar salad was alright, but I missed the croutons. Next time I'll just get the fries. 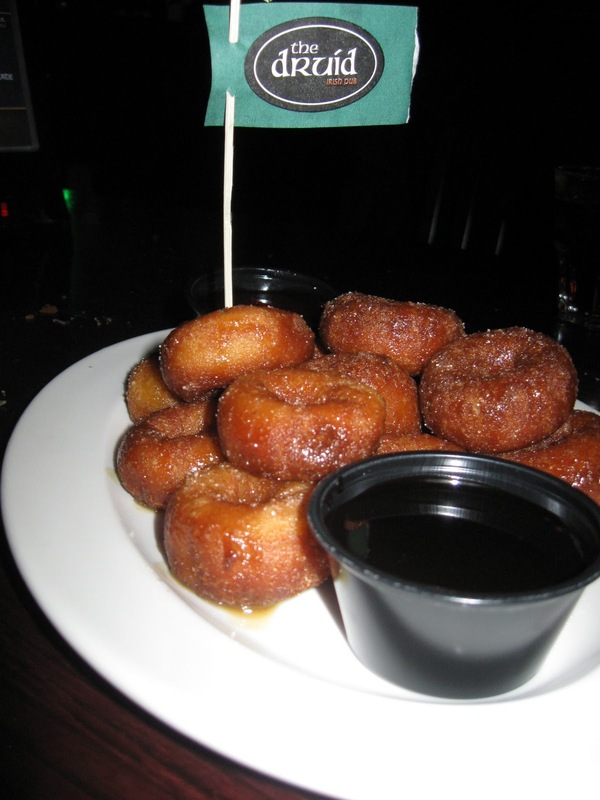 We finished off with the fresh made mini donuts. 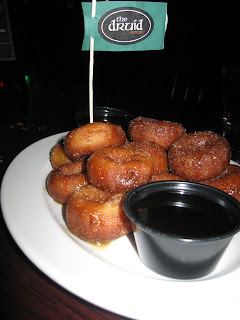 They were warm and a little sticky with sugar and came with chocolate sauce and strawberry coulis for dipping. A third dip, caramel, was mentioned on the menu, but was no where to be found. Honestly, we'd polished off the plate before we could have even asked for them -- they were really tasty! The Druid's got an inviting atmosphere, the staff is friendly and helpful, and the drinks are good. 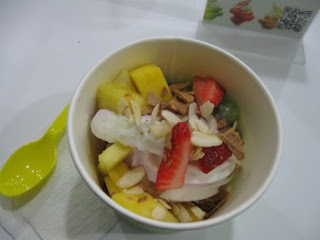 As for food, there are some outstanding hits as well as a few near-misses. They're definitely a pub first, but still give attention to their food, creating unique and homemade dishes. I wouldn't hesitate in recommending The Druid as a place for hanging out, drinking and munching with friends. Located on the ground level of Manulife place, Zenari's offers Italian fare and cookware for the downtown crowd. For those with time to spare, there is a more traditional restaurant section with full sit-down ordering and table service to enjoy a leisurely dinner, wine, and sometimes live music. Customers in more of a hurry can order at the counter and take their orders out or have them brought to their tables. The soups at Zenari's are popular with the lunch crowd, so I decided to give one of the two feature soups a try. The three pasta soup I chose consisted a basic tomato base, vegetables, tortellini, spaghetti, macaroni, and the rare bean. It would make a good side soup, but wasn't hearty enough to be an entire lunch. The other option, mulligatawny, seemed to be the soup most customers were opting for, and maybe that should have clued me in. This one was a bit of a let-down. Soups come with a slice of buttered bread (which will help make a thinner soup like the above into a more satisfying meal). It was fresh and pretty dense. Zenari's has a daily pasta (today's was farafelle) and a couple of daily sauces (as well as several sauces which are always available). I was disappointed to discover that the pastas were not homemade or fresh, and disappointed further with my mushy farafelle. I prefer pasta al dente, but I supposed that it's hard to prepare and keep pasta a particular texture when serving crowds quickly in the lunch rush. The chicken pesto sauce was one of the day's featured sauces, and it was nice with lots of chunks of chicken, tomatoes, and creamy pesto. With all the stuff in it, though, I thought it was an odd choice to feature with farafelle as it didn't lend itself well to coating or mixing. A spinach risotto is always available, but Zenari's features a special risotto each day as well. The fennel and sausage risotto I ordered that day was marvelous with great texture. The aromatic taste of fennel doesn't work for everyone's tastes, but I love it! Everything combined with plenty of savory sausage made an awesome dish. Took a chicken sandwich to-go, and received it unheated, so I threw it on my griddler when I got home. Good sized pieces of chicken breast, tomatoes, lettuce, a fresh bun, and what I think was probably pesto resulted in a really good sandwich. Wanting to give the pasta another shot on another day, I tried their linguine with bolognese sauce, a regular menu sauce. The pasta was cooked closer to al dente this time, though it was also not homemade or fresh. The bolognese sauce was savory from the meat and bright from the tomatoes with just the right amount of salt to bring it all together. There are lots of dessert options at Zenari's: rice pudding, tiramisu, pies, squares... you name it! The blueberry and rhubarb crumble was an easy choice for me.They brought it out warm with whipped cream. The tartness of the rhubarb was the dominant flavor but the sweetness of the blueberries balanced it just enough. The the crumble was sweet with a hint of cinnamon, and not at all soggy in texture. Zenari's is not fine dining, but it is a welcome alternative to the food court fare otherwise available in the malls. It's handy for people downtown, quick, relatively inexpensive and has plenty of variety. You might have to swing a few times before you hit a dish that's a homerun, but I think their menu has something for almost anyone. I've walked past the V Sandwich shop on Whyte many times, but have always been on my way somewhere else. So, when I was wandering along Rice Howard Way in search of dinner and stumbled upon their downtown location, I had to go in. 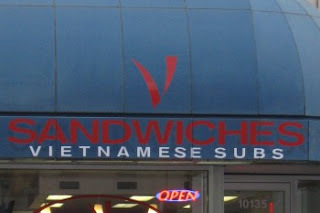 V Sandwiches is definitely a takeout place. There are no tables, only a counter and 3 chairs set against the window. 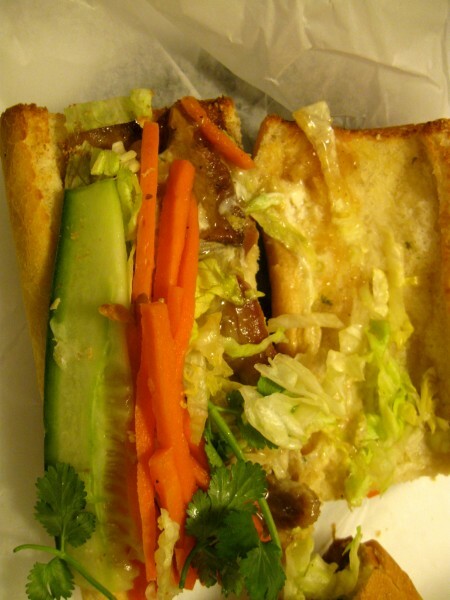 A variety of subs are offered using the same bread and veggie backbone for about $6 each. 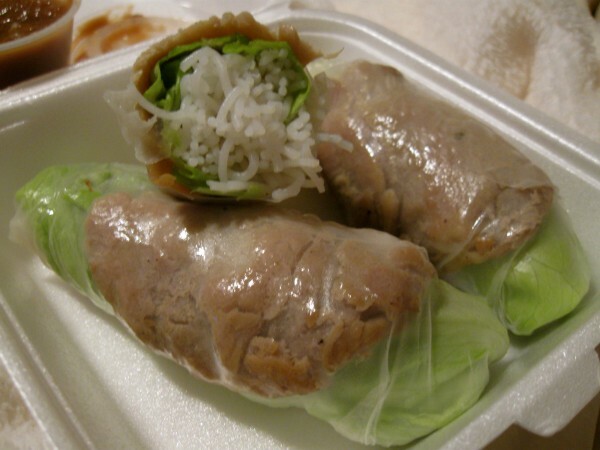 Salad rolls, vermicelli bowls, and a few wraps and soup are also available. The salad rolls looked beautiful, and the pork had nice flavor. The inside was stuffed with vermicelli, but I would have liked a little more to these -- perhaps some cucumber, carrot, or herbs? Not even the accompanying peanut sauce, which was tasty (but could have used a touch of heat), saved these for me. It was all just too plain for my liking. The satay beef is the most popular of V Sandwiches' signature subs, so I had to try it. The beef was sliced to a medium thickness, and was fairly tender. The satay sauce it was covered with was savory with a touch of peanut flavor and moderate heat. Combined with the perfectly toasted bread, veggies, and house sauce, this was a delight to eat with spicy, complex flavor. All the signature subs come with cucumber, onions, cilantro, pickled carrots and the house sauce (which, according to the employee I asked, is hoisin-based). The BBQ pork was a bit on the chewy side, but I really enjoyed the sweetness of the sauce and the way it contrasted with the pickled carrots. It's a close call, but I think I prefer the BBQ pork over the satay beef. 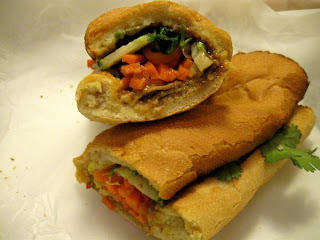 Although the salad rolls didn't wow me, the subs we sampled were both very tasty. Preparation was reasonably quick (you can call ahead your order if you're in a big rush) and the prices quite reasonable. If you live or work nearby, it's definitely worth checking out. 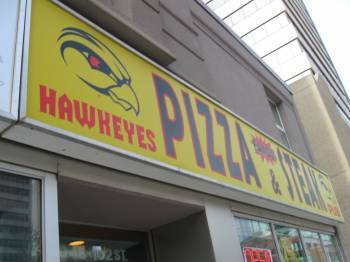 Hawkeye's is a pub and restaurant located on 102 Street just south of Jasper. The space is divided into a dive-ish pub side (complete with VLTs, and, apparently, karaoke on weekends), and a restaurant side which is pushed back from the entrance and is a bit dungeon-like with no windows. It's got plenty of booths and the central round tables have comfortable chairs. Minors are not allowed in either part of the establishment. I walked from the LRT for lunch so I wanted to start off with something to warm me up. The soup of the day, seafood chowder, was being readily ordered by others, but I opted for the wonton soup, a regular menu item. 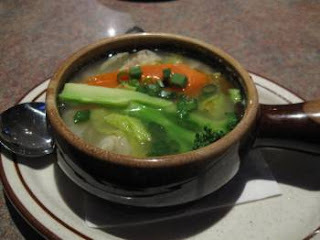 Within moments, my server reappeared with a really lovely soup filled with wontons, greens, and vegetables. The chicken broth was savory and not-too-salty and the broccoli and carrots were tender-crisp. The wontons were abundant and delicious, filled with pork. The pizzas are arguably what Hawkeye's Too is best known for. My salami and extra cheese pizza was ready in about 10 minutes and came out so piping hot I actually burned my tongue on my first bite. 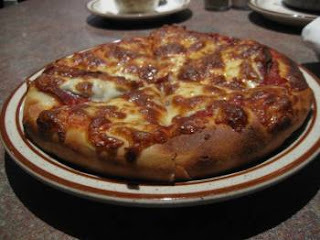 The crust is moderately thick and was cooked to a perfect golden brown as was the cheese. The pizza sauce had a nice little zest to it. My only complaint was that, for an extra cheese pizza, more cheese would've been great. Finally, passing the true test of a good pizza, the leftovers were even better than the pizza initially. 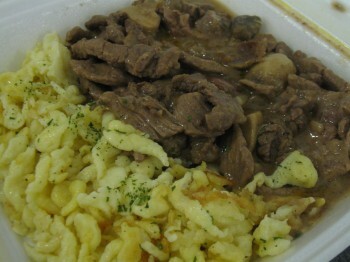 One of the lunch specials was prime beef stroganoff with spätzle (a soft German egg noodle). The beef and mushrooms were delicious in the savory & slightly salted brown gravy. I've only ever had stroganoff with the standard flat egg noodles, but the spätzle were a delightful change! 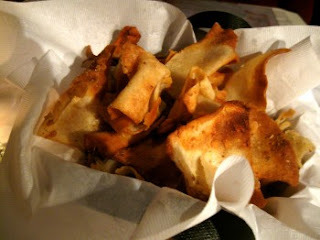 They were rustic with a good chewy and soft texture (a few pieces were more dry and flakier, which I actually enjoyed). It was impossible not to hear the others in the restaurant praising this dish and I had to agree. Hawkeye's Too has a laid back atmosphere that appeals to and attracts all types. It's unpretentious, the prices are very reasonable, and the service is efficient and snappy. During the noon hour, I was in and out in less than 35 minutes. All that on top of the wide variety of tasty homemade food left me really impressed and I'm already looking forward to returning. When I'd visited Edmonton previously as a tourist, The Crêperie was always recommended as a place to eat. It's in an accessible and visible location on restaurant row of the Revillon Boardwalk, and since opening in 1976 has become a tradition to many Edmontonians I've spoken with. We entered the restaurant from the street level, and head down a small set of stairs where we met our hostess. Being in a lower level, surrounded by cement gives the feeling of an old cellar, but brightened up with floral patterns and decent lighting. It was Friday night and, although not packed, the place was busy and we were glad we'd been organized enough to make a reservation. The croustilles au fromage (translation: cheese chips) are cheese crepes, sliced into chip-size pieces and deep-fried. They arrived warm, seasoned with salt, and were served with a mildly garlicky yogurt dip. Some of our chips must have been stuck together before entering the fryer, as they were clumped and still soft like a regular crepe. My friend and I agreed that we actually preferred these to the the regular crunchy ones! The dip was a nice addition, and helped mellow out the saltiness of the chips. They are addictive, but the portion was so generous that between the two of us we only made it through half of the small order. 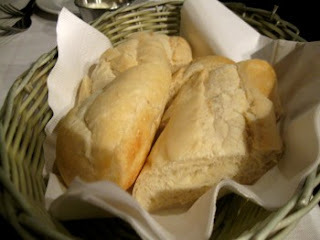 After we placed our order for entrees, our waiter brought out some bread. It was slightly warm, soft on the inside, and not too crusty. It was served with a tasty garlic butter, though I'm sure regular butter is available if requested. Most of their savory crepes are topped with hollandaise, I can't comment on it as both our choices were those topped with a mozzarella cheese blend. 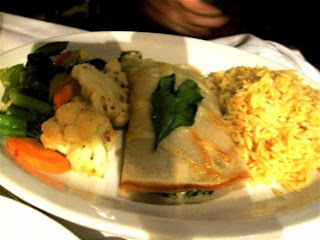 The crepe Florentine, filled with creamed spinach and mushrooms, was on the bland side for my friend. She loaded it it up with black pepper for seasoning. The orzo was pleasant, but again, not particularly interesting. 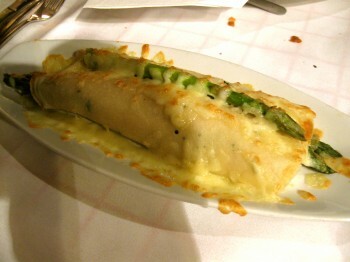 My crepe asparagus was filled with lots of asparagus and brie and baked with the mozzarella cheese blend. The texture of the crepe was soft but slightly chewy -- a lot like I had in France. It was hearty and the asparagus contributed some flavor, but like my friend I felt it was missing some basic seasoning. I decided to forgo the sides and pay an extra $3 for a fruit salad, and after tasting the orzo and vegetables, I was glad I did. 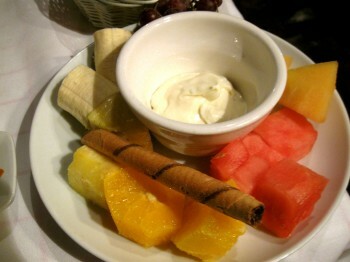 The fruit was fresh, and the honey-lime dip it came with was actually really delicious. We couldn't leave without trying a dessert crepe, could we? 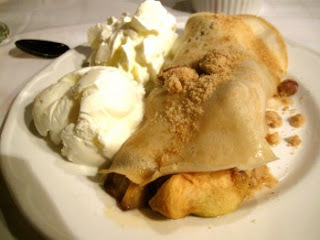 The crepe aux pommes immediately stood out on the menu. It came filled with baked apples, brown sugar, and streusel and was served with vanilla ice cream and whipped cream. The baked apples were a nice change from the apple pie filling you find at many crepe outlets, but I would have preferred it to come out warmer, so I could have melted some of my ice cream over top of it. We ate the dish and enjoyed it, but it was far from mind-blowing. We liked the cellar-like setting of The Crêperie and the service we received was attentive and friendly; however, for the price, we felt much of the food lacked a certain je ne sais quoi. You will go home full, but probably not entirely satisfied. While French cooking is famous for its buttery, creamy dishes, it also employs fresh herbs, spices, and seasoning to lend aroma, brightness, and flavor to even the heaviest of dishes. 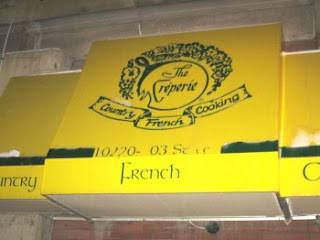 The dishes at The Crêperie emphasize richness over flavor, but the two are not, and should not be treated as mutually exclusive.